Thanks for stopping by. If you are looking for the B.F.F Blog Hop click here. I am submitting this card in the Designed 2 Delight Challenge. I do think the male Peacock is so pretty/handsome. Enjoy. Comments are welcome. GOD Bless! Please don't forget to stop by CTO on Tuesday to check out the new Design Team (DT) members!! Very nice! Love the blues! Sorry, I meant to say, Beautiful card; such vibrant colors! !--Pat N.
Beautiful card! I especially like the embossing in the background! Very nice card love the colors! 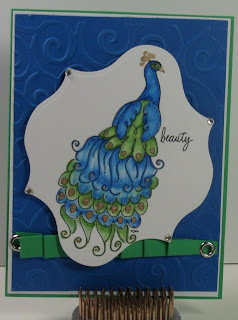 Girlia, your peacock and the card is beautiful!!! Good luck in the challenge!!! Gorgeous!! The pretty blue embossed background makes your gorgeous peacock just pop!!!! What a pretty peacock. Thanks for the heads up on my win! Your having a good night. Talk to you soon. keep up the good work. Your peacock is handsome and love your colouring. Hello! I came across your blog and just had to become a follower! I love all of your past creations and can't wait to see how you will inspire me next! I love the peacock, and the colors are WONDERFUL! Thank you for sharing your crafty-ness! Love the colors, such a pretty card! This is a beautiful and elegant card! Your peacock is stunning. Love the colors, embossing, and ribbon. Very pretty, love your colors! Fantastic job! Love the colors!